A rare thing in a parent’s life during the early year. Well maybe not, I remember keeping my Mum up with worry in my rebel teen years – that’s a different story for another time. Well with my daughter, she was that baby you only heard stories about but never met. She only cried when she was wet or hungry. Slept in her own room and through the night (solid 7 hours) from 2 months on. She was ‘dream’ baby. WOW! Who is this child. What has she done with my sleeping baby. What uses to take 5 possibly 6 minutes now can take up to 3 freaking hours. Mommy, too dark. too light. too noisey. bubba (water). hug. story. ahhhh GO TO SLEEP. My husband is a pro at this. He can get her down in 20 minutes. I was going for a solid 45 minutes and was ripping my hair out. I finally walked out of her room and had tear welling up in my eyes. My zen like husband, looks at me and said ‘I got this’. He grabs his tablet, goes into a screaming room and comes out of a silent room. Cool as a cucumber. Now most parents will agree that children are exhausting both mentally and physically. We all go through ups and downs, and as adults we are fortunate enough to have at least the understanding of how to handle our emotions. Toddlers just scream. They have a fit. A temper tantrum. They won’t admit when they are tired. They won’t tell when they want to sleep, eat, nap or be alone. I understand why the wee ones act the way we do… to an extent. They do not have the understanding and possibly the words to describe it all. Scarlett has been in her toddler bed for a week now and I swear it’s getting worst. It’s getting harder on me, all around. She screams at me. She tells me I’m mean, which just breaks my heart and takes everything I have left at the end of the day not to just drop to the ground and burst into tears. I don’t know what it is. Maybe it’s because I am exhausted by 4:00pm every day and need to rest but I keep going because the day isn’t done and by bedtime, I’m acting like a toddler. Just can’t express my emotions to my 2 year old that I am also very time. I feel like I am failing. I feel like this is that one thing I can’t do. Part of me is saying, just let her sleep in your bed, but I do not sleep at all if she’s in my bed and really who is that helping? Another part of me is saying, let her scream it out, shut the door. But again who is that really helping? Then there’s a part me of that is just throwing up my hands in the air and giving up. I have absolutely no idea what I am doing. No. Really. I have no idea. I get overwhelmed and just want to give up! But I don’t. I keep going. 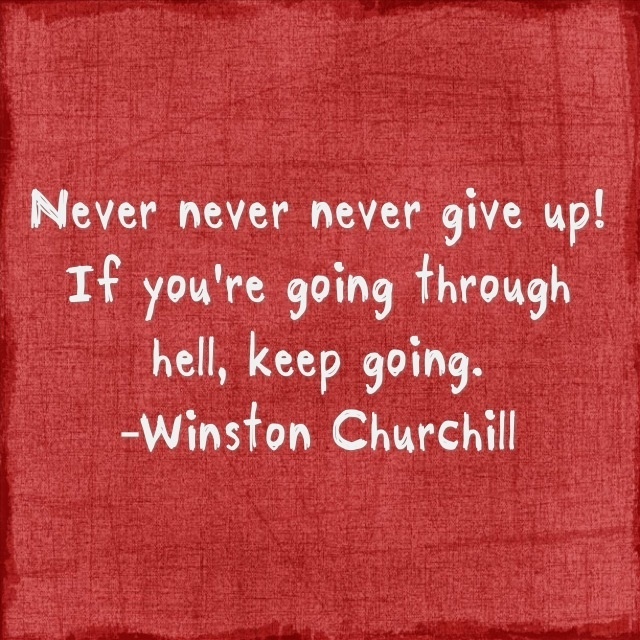 What is that quote Winston Churchill says, “If you’re going through hell, keep going.” Or is that my husband who says that. Either way. That is my whole game plan. I am just going to keep going. I don’t really have much of a choice. Parenting is what it is. You deal and sort with the situation you are given. This whole toddler bed change has been really hard on me. I honestly do feel like I am failing. I feel like I am making absolutely no progress. The more tired Scarlett gets, that harder it is for her to listen and pay attention. Where is the re-set button? !